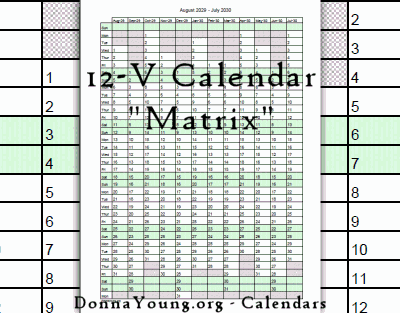 12-V is nicknamed "Matrix" because the days in the months on this calendar run down the page in a single column. The weekends are green and non-days are gray. The calendars begin in the months of January, July, and August. The midyear calendars have typeable headers. Instructions: Change the headers and then print, more information below. The midyear calendars have a typeable header. If your computer is compatible with the typeable fields in the midyear calendar, then the text in the header may be changed or removed before printing. Adobe READER will not save what you type! The typeable pdf's are meant to be printed. Do not consider using the typeable pdf's as a running document UNLESS you have Adobe Acrobat.